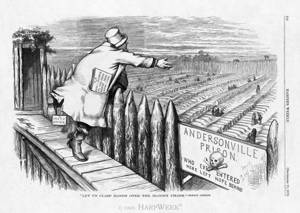 One of the most spectacular “clasping hands” cartoons shows Greeley trying to extend his reach across the grotesque vastness of the Union graves at Andersonville Prison in a ludicrous effort to connect with the hand of a tiny hooded figure on the far side. During the final year of the Civil War, 13,000 Union enlisted men perished of starvation or disease at the notorious Confederate prison. The prison commandant, Henry Wirz, became the only person executed for his participation in the Confederate war effort. “Let us Clasp Hands Over the Bloody Chasm” (dated September 21, 1872) appeared in print on September 11. In a stroke of fortunate timing, which Nast could not have predicted, Greeley received an invitation on September 15 to visit Cincinnati (September 19-21), which was hastily extended into a campaign swing through the Upper South. The speaking tour made Greeley only the third major-party presidential nominee to take his message directly to the people (Stephen Douglas in 1860 and Horatio Seymour in 1868 took brief campaign trips).